Imagine a world populated by woolly mammoths, giant sloths and car-sized armadillos – 50,000 years ago more than 150 types of these mysterious large-bodied mammals roamed our planet. But by 10,000 years ago, two-thirds of them had disappeared. Since the end of the 19th century, scientists have puzzled over where these “megafauna” went. In 1796, the famous French palaeontologist Georges Cuvier suggested a global catastrophe had wiped them out. Others were appalled. The great Thomas Jefferson was so against Cuvier’s idea he sent an expedition to try to find vast herds of these animals grazing contentedly in the American interior. The only thing anyone could say with certainty was there should be a lot more of them than we see today. Alfred Wallace, who wrote the first paper on evolution by natural selection with Charles Darwin, noted that “we live in a zoologically impoverished world, from which all the hugest, and fiercest, and strangest forms have recently disappeared”. It’s one of the great historical whodunnits: what happened to the megafauna, and when did they disappear? As with any good mystery, there are two main suspects: climate and humans. 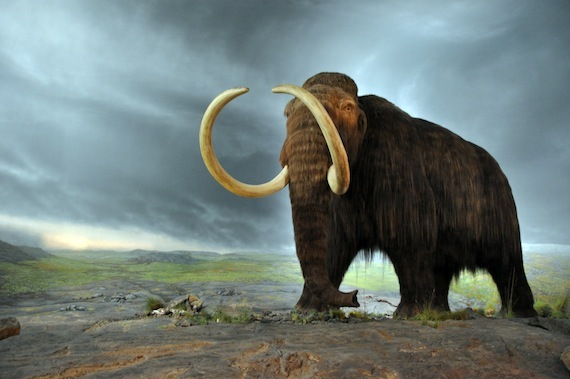 The idea that our ancestors may have hunted the huge beasts to extinction has long been a popular view, particularly as the spread of humans around the world appears closely associated with their demise. Several major criticisms continue to be levelled at this theory, the most popular being that many large animals are still present in Africa, despite it having the longest record of occupation by people. Others in turn argue that humans co-evolved alongside megafauna in Africa for millions of years, giving animals time to learn from human behaviour. The alternative is that a rapidly changing climate caused the habitat of the megafauna to shrink or disappear. As the planet warmed out of the last ice age 12,000 years ago, many animals would have struggled to adapt to the new environment. A major criticism here is that there have been other major climatic changes in the past, some of which have been equally extreme and rapid. What could have been so different with this most recent warming? In a research paper published in the journal Science, we report new advances in ancient DNA, carbon dating and climate reconstruction that finally give some answers. Previously, as long as species appeared to survive in the fossil record the interpretation had been that nothing significant had happened for tens of millennia. But thanks to ancient DNA analysis of megafaunal bones we now know that this approach has missed a series of events throughout the past 50,000 years when major parts of a species’ genetic diversity, or even the whole species itself, disappeared. Alongside this, more accurate carbon dating of the fossil remains shows these extinctions did not all happen at a single time but were staggered through time and space. 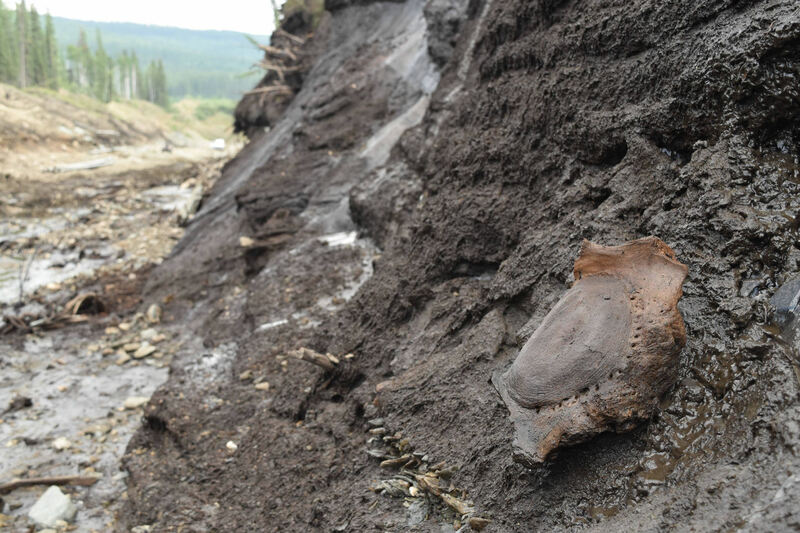 The authors recently discovered this DNA-filled mammoth vertebrae preserved in ice, while doing fieldwork in northern Canada. It’s important to realise the backdrop to these extinctions was a wildly fluctuating climate. The ice age of the northern hemisphere was not one long frigid wasteland. Instead, frozen conditions were punctuated by many short, rapid warming periods, known as interstadials, where temperatures would soar from 4 to 16˚C within just a few decades and last for hundreds to thousands of years. They represent some of the most profound climate changes detected in the recent geological past. When we precisely compared the dates for European and American extinctions with climate records, we were amazed to find they coincided with the abrupt warming of the interstadials; in stark contrast there is a complete absence of extinctions at the height of the last ice age. As temperatures rose during the interstadials, dramatic shifts in global rainfall and vegetation patterns would have placed the megafauna under immense stress. Those that could not adapt to the rapidly changing conditions would have quickly succumbed. The European cave lion, for instance (Panthera leo spelaea in the chart below), survived through periods when much of the continent was covered in ice, only to go extinct during relatively benign conditions around 14,500 years ago. Megafaunal extinctions mapped against climate change. Temperature history is shown along the bottom; the black and red bars represent 95% confidence ranges. Most animals went extinct during warm interstadial periods (shaded brown), and the last ice age (shaded blue) had almost no effect. There seems little doubt humans would have contributed to extinctions, however. While the dramatic climate shifts were the major driver in megafaunal extinction events, humans would have applied the coup de grâce to populations already suffering major stress. In one likely scenario, humans would have concentrated their hunting efforts along dispersal routes, killing the few bold individuals moving out to re-establish an extinct population, causing localised extinctions to expand into larger and larger areas, that would have eventually led to an irreversible ecosystem collapse. It’s likely the scattered pattern of extinctions and the difficulty of detecting them from fossils alone is why the relationship with warming events has not been detected before. So what does this mean for the future? Well for a start, rapidly increasing temperatures are not good news for the megafauna that survived the last warming. 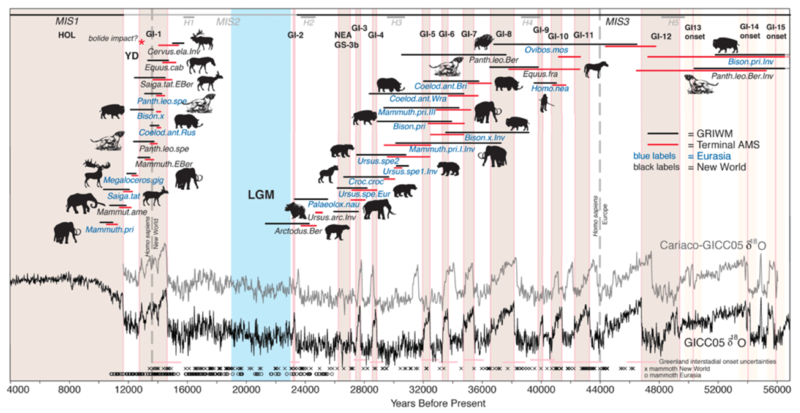 In many ways the rise of atmospheric CO2 levels and resulting warming effects are expected to have a similar rate of change to the onset of past interstadials, heralding another major phase of large mammal extinctions. This seems all the more likely thanks to our “success” in developing the planet’s surface, breaking up areas of natural habitat and disrupting any connectivity that once existed between areas. Migration is becoming increasingly less of an option for species struggling to adapt to changing temperatures with little chance of back filling from neighbouring areas for re-establishing populations. Even after all these years, megafauna are providing a precious lesson from the past. Chris Turney is Professor and ARC Laureate Fellow at UNSW Australia. Alan Cooper is Director, Australian Centre for Ancient DNA at University of Adelaide.